Radon is a radioactive gas that is released during the normal decay of the elements uranium, thorium, and radium primarily found in rocks and soil. Radioactive particles from radon can damage cells that line the lungs and lead to lung cancer. Radon is the second leading cause of lung cancer in the United States and is associated with 15,000 to 22,000 lung cancer deaths each year. Radon gas is naturally occuring as a result of decaying uranium deep in the earth. It rises to the earths surface where it mixes with the atmosphere. If allowed to mix and dilute it is no longer a danger. Radon seeps into confined spaces like a home through the foundation, drain tiles, sump wells or other entry points. Once radon enters a home, it continues it's decaying process into radiation that can easily be inhaled. Like cigarettes, when breathing radon over a long period of time, irreversable damage to the lungs can happen. It is like receiving a chest xray day after day for years. Radon is found in varying concentrations. 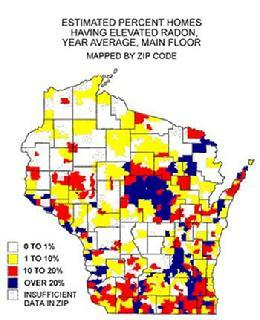 Wisconsin has significant concentrations of radon. The map illustrates the percentages of homes that exceed the threshold of 4 picocuries per liter of air as established by the US EPA. Radon testing is easy and inexpensive. Inspections by a certified inspector can be completed from test-set to analysis in as little as 3 days. January 6, 2017 - State of Wisconsin - Governor Scott Walker proclaims January 2017 as "Radon Action Month". January 27, 2016 - USA Today - Wisconsin - A review of radon tests in Fond du Lac County by the University of Wisconsin-Extension indicates that 11 municipalities have ratings at or above the Environmental Protection Agency’s safety limit. In Fond du Lac, the average radon level, based on 346 tests since 2007, is slightly above what the EPA suggests is optimum, but lower than the level the EPA would be overly concerned about. Radon is an odorless and invisible gas that comes from radioactive breakdown of uranium in soil, rock and water. It is a natural phenomenon. The gas seeps into buildings, especially in basements and ground-level rooms. Once indoors, radon can accumulate. The U.S. Surgeon General says radon is the second-leading cause of lung cancer in America. Experts at UW-Extension tracked radon levels in the state by zip code for nine years and averaged the ratings. Residents with a rating of 2 pico Curies per liter need to reduce their radon exposure by correcting the home’s ventilation, said Diana Hammer Tscheschlok, a natural resources educator at UW-Extension. When the rating is 4 or more, the EPA strongly recommends taking action to reduce the radon. Radon Test Disclosure Law - As of Jan. 1, 2014 all home sellers in MN will be required at the time of offer signing, to disclose whether a radon test has been performed on the offered home. The new law is expected to give all prospective buyers the opportunity to obtain past test results or to test for high radon levels themselves. Washington D.C. - HUD announces that all FHA insured multi-family homes will now require radon testing & mitigation. Approximately 21,000 US citizens die annually from cancer caused by radon gas.